Most boats carry a set of signal flags. Some signal flags are mandatory when entering ports, others are a back up in the case of electronic failure. It is also nice to have a set of signal flags so you can 'dress overall' on important British days or in the presence of a Royal Standard. A set of 40 Signal Flags in seperate pockets. 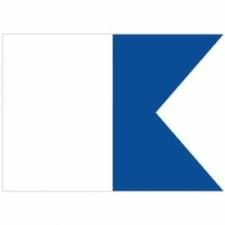 Compass Marine Signal Flag "A"
The Signal Flag "A" means "Diver Below" when stationary or "I am undergoing a sea trial"